Spring feels very much here today! We had Duncan and Ginny McNab in at our Monday morning Values assembly with Daisy the lamb to talk about lamb rearing, feeding, leading, calling and how to prepare for showing your animal. 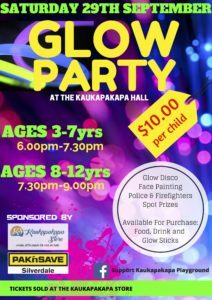 All the planning is well in place by Mrs Taylor and the FOWS-lead for this event by Kylie Allen and Nikki Browne. We hope everyone is well prepared for Ag Day which is the first week back straight after the holidays. Look out for more information about this day in newsletters and on the school website. 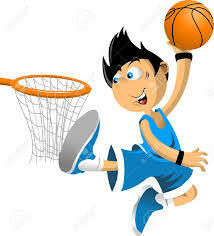 Congratulations – Netball year 6 team who won their competition in Helensville on Saturday. I did enjoy being on the sideline of your final, was amazed at the fabulous new courts and sports grounds built in Helensville. Thank you coaches Nadine Phillips and Christine Frantzen for all your enthusiasm and training and for inviting me to the final. Conservation Week – We are very interested in conserving our bush, we will be ensuring we have re set all our traps in the bush to keep the possums, stoats and rats under control. We have some students who are still keen trappers, who have set the traps and regularly check them. Caretaker – This week we welcome our new caretaker, Richard Lee, and say a huge thank you to Merv Blood who has stepped into the roll so positively over the last weeks. Richard comes with lots of skills and is keen to get to know us. He knows all about waste minimization and composting as well. Winter Sports Prizegiving – This Friday, the 21st of September at 9.15am, Wainui School will be holding a Winter Sports prizegiving, which will also include the Cross Country prizegiving. Year 1 children will only be required for the Cross Country prizegiving. Year 2 children will leave the hall after the netball part is complete and return for the Cross Country prizegiving. 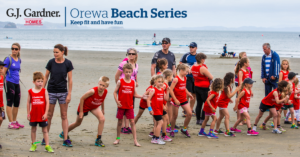 This is an important opportunity to acknowledge all of the children and volunteers who have made this sports season a success, with the largest amount of Wainui teams we’ve ever had. 2 basketball teams, 8 netball teams, 7 hockey teams, it is also a special time to celebrate the coaches and managers. There will be a special morning tea to follow. Thank you Mr Irvine for all your organisation. Garden to Table – More congratulations!! Wainui School has won “The Emerging School category” in the T&G Young Gardener Awards! So exciting for us all. It has only just been announced officially today!! Thank you and huge congratulations to Miss Stevenson for your winning entry into this competition. We will share the details as soon as we have more information but we do know in the near future Wainui School will be in the NZ Gardner magazine!! “Let Loose!” – Takahe team’s performance. I am very much looking forward to the performance on Thursday night by the year 7&8s. Lots of practice has been going on each day by the team, some costumes have been appearing and lots of laughter has been heard!! “Let Loose!” This production is based on a group of eager (and some not-so-eager) school children on their school camp to the aptly-named ‘Slippery Slopes Activity Centre’. This hilarious musical sees them experience a catalogue of mishaps on their way to learning one very important lesson….good friends are worth their weight in lollies! On Wednesday, the 19th of September, there will be a dress rehearsal, starting at 11.30am. The whole school will be in attendance, and parents are invited to attend if they wish. Please be advised that there may be brief stoppages to fine tune things if needed. On Thursday, the 20th of September, there will be an evening performance, starting at 6.30pm. Children will need to be at school by 6pm in order to get themselves organised for the production. This is not a ticketed performance, but a gold coin donation would be appreciated. Lost Property – The pile is growing, please ensure you have all your clothes before the holidays as we wash the left overs and donate them to a good cause. 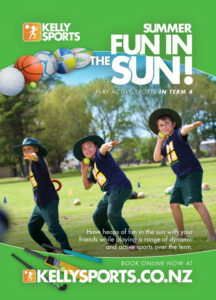 Last week of term 3, please ensure you have paid all outstanding sports registration fees, trip monies and activity fees such as Stu Duval. 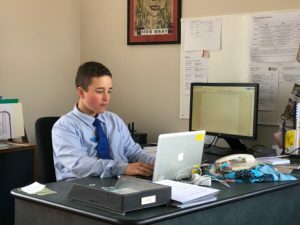 Last Friday Matt Cator a year 7 student was Principal for the Day!! Matt’s family had bid on the privilege of this at the annual Quiz Night. Matt had a wonderful day, starting with Assembly where he presented the certificates and made a short speech. He went on to write something for the newsletter, run an emergency drill – earthquake practice and ensured he gave out lots of stickers and tokens as positive rewards. What a fun day! Here is a picture of Matt and his words to finish this week’s newsletter. Kiwi Team Production – The children of Kiwi team have been practicing long and hard and the countdown is on for our production of ‘Travelling Kiwi’s World of Wonder’. There will be two performances in week 10, a matinee dress rehearsal on Wednesday 26th September at 11.30 am and our evening performance on Thursday 27th September, starting at 6.30pm sharp. To avoid disappointment and to get a good seat, be early. Entry will be by gold coin donation. See you then!! The Kiwi Team. Working Bee Sunday 23rd September 10am to 12pm – We are having a working bee on Sunday 23rd September from 10am to 12pm to tidy up under the school hall to get it ready for Ag day. We would be grateful for any help. Feel free to come for all or part of this time. Light refreshments will be provided. Please bring along a wheelbarrow, rake and shovel. 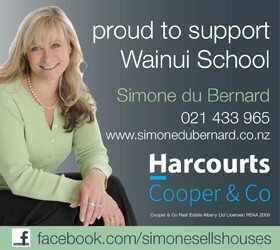 Any queries please contact Kylie by emailing fows@wainui.school.nz. THANK YOU – your support for the working bee is greatly appreciated. Calendar Orders Due This Week – Final reminder that you can order fabulous 2019 calendars, diaries and cards featuring your child’s artwork! You can see product examples at the office. Calendar $13, pack of 8 cards $15, diary $18. These make fabulous gifts for family members, or to have yourself as a keepsake of your child’s work. Order forms were sent home with children a couple of weeks ago, plus there are some in the office. Items will be distributed during the first few weeks of Term 4 (depends on how quickly the printing company process our order). 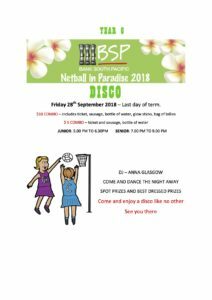 Orders are due by this Friday 21st September – drop your form at the office. You can pay by cash, cheque, EFTPOS or online banking. Please ensure all details on the form are completed or we may be unable to process it. Ag Day – Is fast approaching! Mark this date in your diary now – Friday 19th of October – we hope you are able to join us for the day. Animals must be born between 1st July and 15th of September. 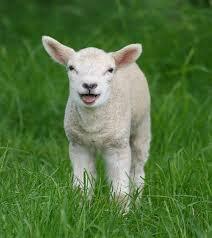 Registration forms for Lambs, Goats and Chickens need to be in the office by this Friday 14th of September. Pet Eggs – On Wednesday 26th September all children who are not showing an animal at Ag Day will be given an egg to care for. Over the holidays, they will make a habitat for their egg and complete the Profile Sheet for their egg in readiness for judging on Ag Day. 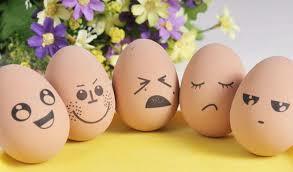 Each child will need a container to take their egg home in on Wednesday 26th September. Wainui Tui’s Yr 6 vs Waimauku Mustangs. Won the FINAL: 14 – 3. POD: Kate Frantzen and Kayla Paladin. Congratulations: This season in the Kaipara Netball league, the Year 6 team, Wainui Tuis, won their grade. Congratulations to: Kate Frantzen, Kayla Paladin, Mia Thomson, Hannah Garside, Ella Newman, Serenity Harris-Hatley and Tara Phillips. 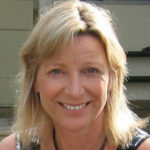 Coached & managed by Christine Frantzen & Nadine Phillips. Well done girls! Wainui Heat Yr 6 vs Dairy Flat. Won: 34 – 0. POD: Tommy Rossiter. At the last assembly, the following students received certificates for “Resourceful”. Kauri: Chloe Kay, Bojan Paladin. Writing: Briar-Rose Stevenson. Kahikatea: Ali Campbell, Lewis Boardman. Writing: Stephen O’Flaherty. Rimu: Ashton Becker-Crawford, Kate Frantzen. Writing: Olly Smith. Matai: Bella Browne Hale, Christopher Gilpin. Writing: Brodie Headford. Totara: Hannah Garside, Vinnie Holmes. Writing: Stevie Waugh. Nikau: Katie Boe, Ayden Krynauw. Writing: Violet Clayton. Kowhai: MacKenzie Allen, Zahara Patterson. Writing: Tamati Bayer. Kohekohe: Locky Jordan, Raya Sams. Writing: Milla Glasgow. Pukatea: Hamish Allen, Alice Jones. Writing: Beau Olliff. Rata: Riley McIntyre, Jaime Tolphof. Writing: Hamish Fincham. Karaka: Eva Sparkes, Scott Tucker. Writing: Flynn Dixon. Puriri Rua: Kayden Le, Oliver Tiedemann. Writing: Jackson Mallon. Puriri: Millie Dunn, Logan Marshall. Writing: Vuliana Lodge. Our amazing Hellyer Cup Winners were Ty Browne Hale (Kahikatea), and Jessie Holmes (Kauri). Tuesday 18th September – Board of Trustees Meeting – 6pm. Wednesday 19th September – Dress Rehearsal “Let Loose” Yr 7/8 – 11.30am. Thursday 20th September – “Let Loose” Production – 6.30pm. Friday 21st September – Winter Sports Prizegiving – 9.15am. Friday 21st September – Last Day for Calendar Fundraising Orders and School Hoodie Orders. 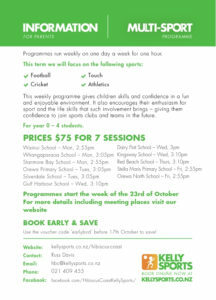 We run a Saturday morning coaching program for Children aged 4 to 15 years old. Turn up anytime between 10am and 12.30. Phone 0272 799 802 for more information. For budding guitarists and drummers – Rock and Pop Academy School Holiday Workshops. Intensive half-day workshops hosted by music professionals to boost your child’s current learning with new and exciting live skills (aimed at Year 6 and above). Glen Child (drums) – opened for Eric Clapton at Vector Arena, has performed with the Ladykillers, Annie Crummer. Phil Roberts (guitar) – Jimi Hendrix Tribute Show performer, has performed with ex-members of DD Smash, The Pretenders, Simple Minds. $150 per student, per session. 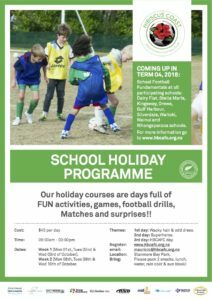 Choose from AM or PM session: 9-12.30pm or 1-4.30pm. Max group size 6. Sibling discount available.